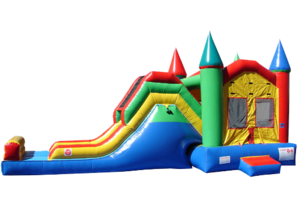 One of our most popular slide combos, the Castle Combo will provide hours of fun for everyone! The bounce area has its own basketball hoop as well. Enter, bounce, shoot some hoops, and then climb the ladder to slide down and start all over. Great for backyard parties as well as organizational events.